Norlex Chemicals had been in dialogue with a German customer – manufacturer and supplier of MBR systems – regarding the range of membrane cleaners, including our specialised MBR cleaners. The MBR systems supplied by the manufacturer are based on submerged membranes, which are normally cleaned by NaOCl solution, filled into the permeate side of the membranes. Other than this, the systems are normally subjected to a full recovery clean using NaOCL, caustic and/or a specialised membrane cleaner 1 to 2 times per year. These recovery cleanings are done by emptying the biological tank and filling it with a cleaning solution that is recirculated in forward flow for about 1 hour. Our customer had a pressing problem with a 2.000 man MBR unit placed on a cruise ship, where the membranes could not be recovered using this standard approach. The production had fallen to such a low level, that the wastewater plant could not keep up with the water flowing to the system. The production was down to below 50% of the designed. MBR KLEAN 210to see, if this could help to restore the membrane permeability. 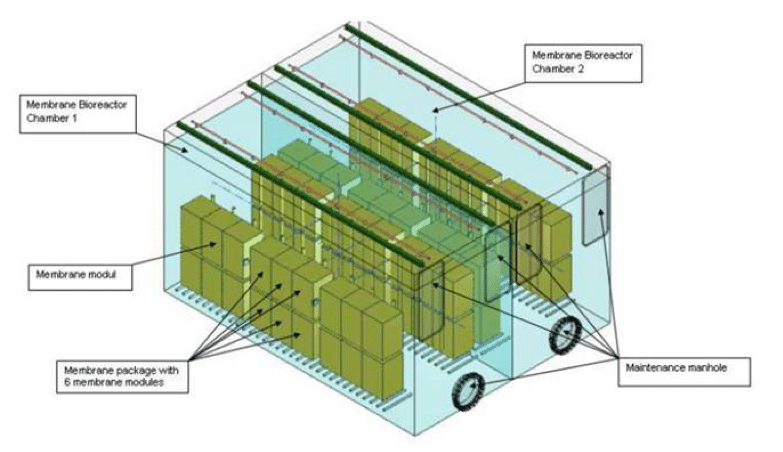 The system is a submerged type MBR system using plate membranes. The system is designed to treat wastewater on a cruise ship from 2.000 people. The unit is placed on a cruise ship, and therefore has limited possibilities to store any excess wastewater that the system cannot treat. Below is a principal drawing of the system design (bio-reactor only). 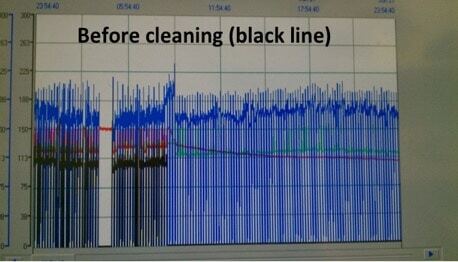 The system had so far been cleaned regularly by backwashing the modules in place with a NaOCl solution. The backwashing had been performed from the inside of the plate membranes with pressure. Due to the fact, that the membranes touch each other during the backwashing procedure nearly no solution entered the biological tank. However due to the increased fouling the liquid could not flow through the membrane. Each block was cleaned monthly by this procedure with a 1000ppm NaOCl solution but the cleanings did not yield the desired results. Gradually the permeability got lower eventually (after about one year) making it impossible to treat all wastewater due to the low permeability. The customer was searching for a new way to perform cleaning as an additional procedure to increase the permeability on a half year basis if necessary. The fouling observed was all over the membranes, resulting in a bad performance of the aeration and following accumulation of particles on the downside of the membrane blocks. This caused further blockages on the plates, which again further reduced the effectiveness of the air scouring. Partly there was also a kind of caking observed. Sludge accumulated between the plates and compressed. This caking could be removed very easily with some fresh water during a manual inspection of the tank. The following pictures illustrate the fouling issues. An analysis of a piece of membrane showed a dark brown discoloration caused by pectines and humic substances. Partly the membrane was smooth and not assigned; partly there were encrustations, which could be removed very easily. These encrustations were identified as bioorganic and insoluble in water. The deposits was not only on the surface but also inside the membrane structure, infiltrating and impregnating the membrane. The following pictures show a new membrane in comparison to a blocked one. Norlex Chemicals proposed a solution, where a full recovery cleaning would be performed using one of our specialised MBR Membrane cleaners. Due to the low pH tolerance of the membranes and the difficulty in handling acid dosing on the ship, we proposed to use MBR KLEAN 210 in a 1,5% solution. The tank was emptied and filled with 70 m3 of water, that was added 1.050 kg MBR KLEAN 210. A cleaning was performed recirculating the cleaning solution for about 1.5 hours through the membranes in normal flow direction. The result of the cleaning was impressive. The permeability was practically doubled increasing from below 120 to above 225 (see below pictures of the permeability before and after the cleaning (black line)). This result was fully satisfactory for our customer, practically restoring their unit’s production capacity to design value. The unit can now easily handle the wastewater produced by the ship. Directly after the cleaning the diffusers have also been changed in order to keep the results of the cleaning success going for as long as possible. MBR KLEAN 210 gave much better performance than any other tested product. MBR KLEAN 210 gave no foaming issues and no compatibility issues. MBR KLEAN 210 gave no concerns regarding corrosion in the tank, as experienced when using NaOCl. 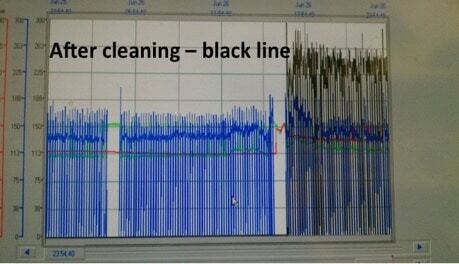 The customer will continue to use MBR KLEAN 210 for bi-annual cleanings. The results indicate possibility to optimise on the concentration of MBR KLEAN 210, lowering the concentration thereby further reducing cost.